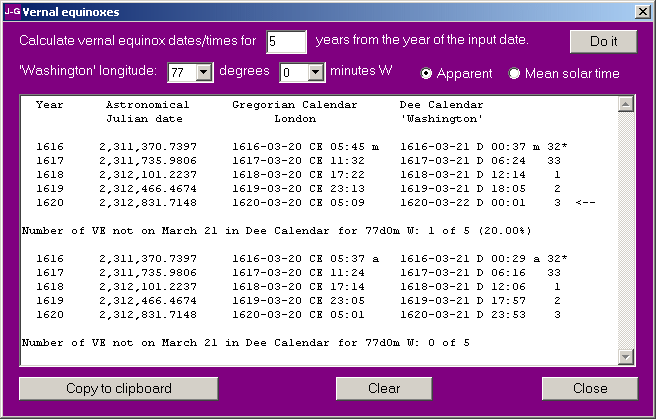 calculation of dates and times of vernal equinoxes for years 1 through 4000 CE in the Gregorian and Dee‑(Cecil) calendars. 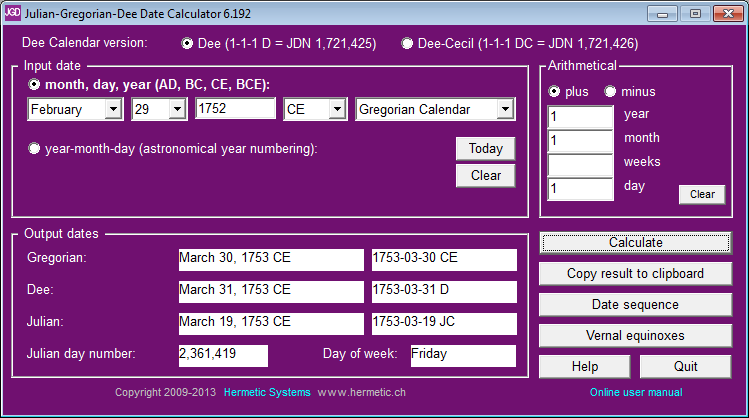 For an explanation of the Dee and the Dee‑Cecil Calendars see The Dee‑Cecil Calendar and its Date Conversion Algorithms. Addition and Subtraction of Days etc. "CE" is an abbreviation for "Common Era" (not for "Christian Era"). The suffixes "CE" and "BCE" ("Before Common Era") in the "religiously neutral" system simply replace the traditional Christian suffixes "A.D." ("Anno Domini") and "B.C." ("Before Christ"), so the "religiously neutral" system of year numbering is no different — except for the cosmetic year designator changes — from that of the proleptic Gregorian Calendar (the Gregorian Calendar projected back prior to its start on October 15, 1582). The term "Common Era Calendar" is used in all articles on this website to mean that calendar which has the same structure (days, months, years) as the proleptic Gregorian Calendar and in which years are numbered according to the astronomical system. Dates in this calendar are always designated "CE". For the month,day,year format a date may have any of four year designators: AD, BC, CE and BCE (as explained above). The Calculate button is enabled only after an input date has been fully specified (including the calendar in which it is a date). Clicking on this button then displays the input date in all three calendars (Gregorian, Julian and either Dee or Dee‑Cecil) and in both formats (as shown in the screenshot above), plus the Julian day number and the day of the week. When an input date is specified in this way the arithmetical function and the date sequence function are not available. After the calendar has been identified the date can be specified with the calendar, and the arithmetical function and the date sequence function then become available again. If an input date is specified using a day of the week then the result of clicking on Calculate may be that the date does not occur on that day of the week in either calendar. It is also possible that the date occurs on that day of the week in both calendars. In this case the output dates will be displayed with the Julian Calendar date highlighted. There is no date with years in the range 1580‑2080 which corresponds to the same day of the week in both calendars. The next date which is on the same day of the week in both calendars is 2100‑03‑01, which is a Monday in both calendars. This situation will continue until 2200‑02‑28, which is a Friday in both calendars. 2200‑02‑29 JC is a Saturday, but there is no 2200‑02‑29 CE. The date following 2200‑02‑28 CE is 2200‑03‑01 CE, which is a Saturday, whereas 2200‑03‑01 JC is a Sunday. After an input date has been completely specified you can specify a number of years, months, weeks and days to be added or subtracted from it. Clicking on the Calculate button then displays the result of adding or subtracting the specified periods to or from the input date. Years are added/subtracted first, then months, then weeks, then days. (This function is not enabled in the trial version; to use it the software must first be activated.) If the result would be an invalid date in a particular calendar (e.g., adding 1 month to 2011‑01‑30 CE) then that date is decremented by one day until a valid date is reached (in this example, 2011‑02‑28 CE). If the input date is fully specifed then the Date Sequence button is enabled. This allows display of a sequence of dates, beginning with the input date, for up to 800 days, for the Common Era Calendar and the corresponding dates in the Dee, or Dee‑Cecil, Calendar. This is mainly so as to observe how the CE dates are correlated with the D and DC dates. An arrow indicates where the CE and Dee(‑Cecil) dates begin or cease to accord with each other (or in other words, when they get in or out of sync). In the example above, 2016‑03‑01 DC follows 2016‑02‑28 DC because 2016 is not a leap year in the Dee‑Cecil Calendar. This function is available only after the software has been activated. Follow this link for an explanation of the astronomical Julian date. The output shown above results from getting vernal equinox times first using mean solar time (marked by m) and then using apparent solar time (marked by a). The numbers 1, 2, 3, etc., at right show the position (1‑33) of the year in the 33‑year cycle. A leap year in that cycle is marked by an asterisk. When mean solar time is selected the times shown are (i) GMT for the Gregorian Calendar and (ii) the mean solar time at the specified longitude for the Dee(‑Cecil) Calendar. When apparent solar time is selected the times shown are (i) apparent solar time at Greenwich for the Gregorian Calendar and (ii) apparent solar time at the specified longitude for the Dee(‑Cecil) Calendar. The Dee Calendar was proposed as a new calendar by the Elizabethan scholar John Dee about 1580, when mean solar time as we know it did not yet exist (it had to await the invention of accurate clocks). Dee calculated midnight as halfway between two noons (according to a sundial). But noon in apparent solar (i.e., sundial) time may differ by up to 16 minutes from noon in mean solar (i.e. clock) time, with the difference varying with the time of year (see The equation of time). At the vernal equinox the difference between apparent solar time and mean solar time is close to 8 minutes. Thus to obtain the times that Dee would have obtained in his observations and calculations it is necessary to select apparent solar time, which results from subtracting 8 minutes from the mean solar time for the given longitude. This produces the a times shown above for the vernal equinox in the Dee(‑Cecil) Calendar. An arrow at the end of a line in the display indicates a year in which the vernal equinox does not occur on the target date: March 21 in the Dee Calendar, March 20 in the Dee‑Cecil Calendar. For an explanation of why these dates are "target dates" see John Dee's Calendar and God's Longitude. Price and ordering: A single-user license is available for a period of 3 months or 1 year or with no time limit (a 'perpetual' license). Prices for each type of license are given at Purchase a User License. An activation key is required in order to make the trial version fully functional, and can be obtained immediately (or soon after) your purchase. Refund: A refund will be provided promptly up to thirty days after purchase if the software does not perform satisfactorily.